Secretary, Christian Association of Nigeria (CAN) Kaduna State Branch, North-west Nigeria, Rev. John Ibrahim has called on governments at all levels to continue to explore ways that will unite its people rather than divide them along race, religion or tribe in their actions and policies. He stated this in a goodwill message at the breaking of fast with Journalists, and representatives of the three communities of Mando, Maraban Rido and Malali, organized by the Global Peace Foundation Nigeria (GPF), held at the Nigerian Union of Journalist Kaduna State Council Headquarters in Kaduna on Monday June 27th 2016. A statement signed by the media and communication officer of the Foundation Richard Pius Garba said, Rev. Ibrahim also tasked Muslims to stick to the teachings of brotherly love and tolerance among-st non Muslims as enshrined in the Holy Quran. “I want to use this medium to commend Global Peace Foundation for this initiative to bringing us all to this place to fellowship and identify with our brothers from the Muslim faith and it is our hope and belief that the unity will not end here.” – Rev. Ibrahim said. Also commenting, the Secretary Jama’atul Nasril Islam Kaduna State Branch, Mallam Ibrahim Isa Kufena, described the program as commendation and worthy of emulation. He noted that, there was the need for all hands to be on deck towards unity and love of one another, and for people to realize that we all chose to worship in the religion in which we do because we all have the right to belong to any faith without being harassed or intimidated. According to the Global Council Trustee of United Religious Initiative, Mr Elisha Buba, “Whatever we do as humans, we must know that we are all one in the sight of God, and as such, let us preach peace and tolerance of each others differences wherever we find ourselves”. Earlier, the Northern Co-coordinators Global Peace Foundation Nigeria, Rev. John Joseph Hayab and Sheikh Haliru Maraya, told the gathering that, the purpose of organizing the program was to encourage the habit of brotherly love and sharing, especially during the Holy Month of Ramadan and other festivities between followers of the two major faiths in the country. 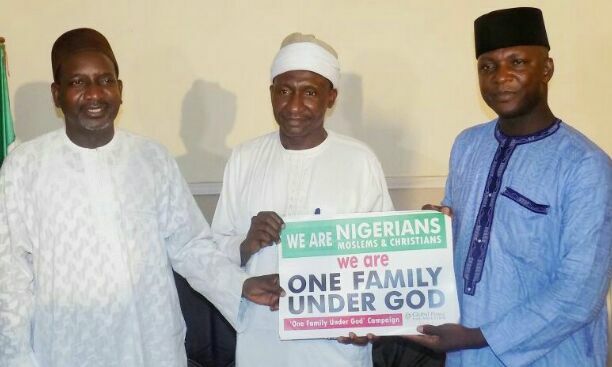 They explained that the Foundation discourages division and hate between followers of different faiths, thereby, encouraging tolerance and respect for each others religion under its ‘One Family Under God’ Campaign in Kaduna State. The Northern Co-coordinators encouraged religious and opinion leaders to ensure they promote what unites the people than what divides them for improved peaceful co-existence and development. In a remark, the NUJ Chairman Kaduna State Council, Comrade Garba Muhammad thanked the Global Peace Foundation for organizing the program which he noted that, members will key into the ‘One Family Under God’ Campaign through the contents of their reportage. High point of the event was the breaking of fast as members of One Family by followers of both faiths.